Have you ever encountered such a problem in rainy days? When you jump on a crowded train after escaping a downpour your dripping wet umbrella usually brushes up against your bag, your clothes or -even worse- a stranger. But by inverting the design, the wet side of the umbrella faces inward when closed, exposing only the dry side. And that’s not all: the creative design makes it easier to open when coming out of a car or other covered area, and when not in use the umbrella can stands up on its own! 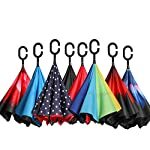 Unique design double layer inside out umbrella, make it easy for you on raining day, won’t wet your car, documents or others. Advanced double layer ribs made the inverted umbrella more sturdy. 23 in X 8 Panels is large enough for Many People . With a simple click of the embedded button, you can open and close the umbrella in confined spaces when entering or exiting a building or car and it’s less awkward and more safer to open and close when in crowds, since the danger to poke in people’s eyes has been removed by the design. The straight umbrella easily slices through all winds. Due to its aerodynamic design, the umbrella always finds the most comfortable position in the wind which makes it exceptionally pleasant to use,even in strong gales. If the canopy flips, it can be rectified at the push of a button.